Before getting started with the “HPA Hierarchy of Training” we need to define some terms…. Hierarchically Nested Combinatoriality – An explanation of properties at any one level of complexity having risen from a particular small subset of properties at any one level of complexity below. Parsimonious Theory- A theory that involves simple explanations, yet still accounts for the larger picture. Why are these terms important? 1) Each tier (or level) of the pyramid builds off of the level below. For example; take absolute strength and muscular endurance. While muscular endurance is a CRITICAL component needed to excel in crossfit, one must have requisite strength before this becomes a factor. Consequently, if someone has great muscular endurance, but poor absolute strength it is a completely different issue than is someone has great absolute strength and poor muscular endurance (relative to their competition). The former athlete lacks a proper foundation, the later needs to build upon that foundation. 2) We can go on and on all day breaking things down and getting lost in the details. But, at the end of the day a sound, yet simple, theory can be extrapolated to various situations and still hold true. That is the goal of this article; not an all inclusive end all be all piece of literature. Consequently, the Hierarchy (seen below) does not include all aspects/ characteristics of training, nor will it apply to all sports. However, it contains the foundational elements required for training in The Sport of Fitness. So now that we’ve gotten that all out of the way we can move forward…. There comes a point in every Crossfit Athlete’s career when they hit a plateau and stop progressing. This is when one needs to go back to the drawing board and rethink their training. It is also where most go wrong… way wrong. In a sport that defines itself by the credo of “Constantly varied functional movements performed at high intensities” it’s no wonder that most stick to those principals in training. If you want to get better at high intensity work, you should do more high intensity work or perform at a high(er) intensity. Right? WRONG. This logic is equivalent to middle distance runner who is great at the 600-800m training to get his 200m time faster in hope of it improving his mile (rather than building a larger base so he can preserve his speed- more to come on this concept in another article). In actuality, what many Mixed Modal Athletes are lacking is a strong foundation of low intensity aerobic work. While many in the CF community demonize LSD (long slow distance) work, it has myriads of benefits. I’ve already written extensively on the mechanisms and “why’s”; so if you interested check that out HERE. However, there are better and worse ways to build an aerobic base (Theres is no right or wrong). Just like in strength training, building an aerobic base requires well thought out programming/ progressions. You would never just pick random weights up and do whatever set/ rep scheme comes to mind at that very moment. So why do athletes just go run a random time/ distance or do a long “met-con” every other week and expect their aerobic capacity to significantly improve? It only makes sense that you would need a well programmed progression to build your aerobic capacity without losing strength or affecting your recovery. While there are many ways to do this, we have developed our own protocols based on what we have found to be most effective with our clients, which we will cover extensively in our soon to be released seminar series. Contrary to what many will tell you (Cough. Rudy Nielsen of Outlaw. Cough), absolute strength is NOT everything in the Sport of Fitness. While it is critical in our sport, up to a point, there comes a time where an additional level of strength will NOT help you. This is not to say that competitors in our sport do not need to be strong though. That would be absurd. If you can’t lift the weight you cant play the game (ie- Josh Bridges on the heavy DL’s at the 2013 games). This is why absolute strength lies at the bottom of the hierarchy. It serves as s foundation for the CP-Battery and Muscular Endurance which are elements of Tier Two in the hierarchy (Note- In reality I would classify CPB as Tier 2a, and Musc End as 2b. Meaning Muscular Endurance falls higher up on the pyramid). Conceptually this may be hard to grasp, and will go against what may have had ingrained in their minds for years. However, we’ve written extensively on this topic already. So instead of going down a rabbit hole here i’ll defer you to the following article/link…. “ATP-CP Battery: Why Absolute Strength Isn’t Everything In the Sport of Fitness”. 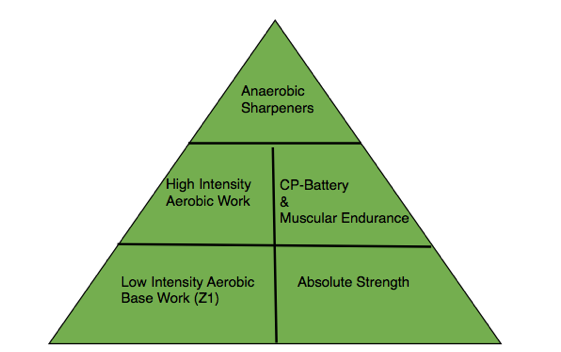 Based on the principals of hierarchically nested combinatoriality, as well as the diagram featured above, it should be quite apparent that higher powered aerobic efforts build off development of the aerobic base; and muscular endurance/ CP-battery development build of the acquisition of absolute strength. What may be less apparent based on the diagram though is that Aerobic base development will tie into improving muscular endurance/ the CP-Battery (as will absolute strength with high powered aerobic work), though it will happen in an indirect fashion. This section will be dedicated to exploring those “Tier Two Topics”. As previously discussed, low level aerobic work serves the purpose of providing a base to layer high intensity work upon. However, what we have not yet mentioned are the specific functions of high(er) intensity aerobic work. Which are sport specific developments in the realms of aerobic development, fuel usage, pacing, and composure under breathing/fatigue with mixed modal pieces. From a programming standpoint this is where things often go awry. If incorrectly prescribed high(er) intensity aerobic work can become lactic work, which is damaging to the nervous system, as well as the aerobic system (this distinction is especially important when developing aerobic threshold progressions). This will not only hamper strength gains, but it will also denature aerobic enzymes and hurt the adaptations we are aiming to foster. Because of this it is critical that high(er) intensity aerobic work is prescribed in correct work to rest ratios, the movements/ number of contractions allow for sustainability, and the % effort are correct relative to the individual’s level of aerobic development. As discussed above, there comes a point where increased levels of strength will not improve performance within the sport of fitness (barring events such as 1RM’s). This is where the development of the CP-Battery picks up the slack. The reason you ask? That is due to the CP-Batteries ability to regenerate creatine phosphate between efforts. In the Sport of Fitness we rarely do one maximal lift, rest 3-5 minutes, take another attempt, then move on. Instead we do subsequent near maximal lifts in quick succession (ladders), or have to move heavy, near maximal, weights with a high turnover within a workout. This is why absolute strength is NOT the issue (unless you are weak enough where you cannot move the weight at all, as discussed in the tier one topic section). The issue is whether or not your body can re-synthesize the phosphates required to make the lift quick enough (or at all) within the given work piece. Consequently, the CP-Recovery system would be a more sufficient name for this sub-topic. In actuality i’d place muscular endurance one tier above the ATP-CP Battery in terms of a CP (creatine phosphate) based hierarchy, but conceptually it makes more sense to place it on tier two when factoring in energy systems (the “why” is beyond the scope of this article; but if you are interested I will cover this in the future- however, you should note that aerobic base development ties into muscular endurance development on a cellular level). In middle distance running (think 1600m to 3200m) the 80/20 method is a common approach to training. This means that 80% of training is performed at a low intensity, and 20% is performed at higher intensities (in terms of total weekly volume). Does this sound familiar? Knowing this we can now create a parallel to the hierarchy where the middle distance runners 80%/20% are equivalent to tier one/ tier two respectively (ie- 80% of training is constituted by low level aerobic base work while the other 20% is made up of higher powered aerobic work). So what makes up the third tier in a middle distance runners training? Sharpeners. This is where the middle distance runner gets to layer in some pure speed work, feel out their game pace/ engine and SHARPEN the base they have progressively built through the season. Consequently, sharpeners serve a similar purpose in the training of mixed modal athletes. Though, they take a different form to match the demands of our sport. For those looking to compete in Crossfit sharpeners can be used to blend short, power based, work pieces with longer efforts, which will help them excel in that ~7 Minute “Grey Zone” where the lines between energy systems/ fuel usage become blurred. They can also be used to develop pain tolerance, develop ones game pace, or teach the body to use lactate efficiently as a fuel source (via the brooks cycle- aka the “lactate shuttle”). When taking a step back/ looking at the big picture we first need to assess an athlete before applying this knowledge. Not only in terms of where they sit physically on the hierarchy, but also where they sit in the year relative to their priority competition. Does the athlete in question need to build a foundation, or sharpen/ build upon what they already posses? These are big picture questions that I cannot simply answer for you; and in reality one should already know the answers to these questions. However, this is not always the case. Which is why it is critical that you, or your coach, not only implement an effective assessment protocol, but also design a periodization plan around it and follow evidence based training protocols to allow you to reach you goals in the most efficient/ effective manner- all of which will be covered in the next installment of “The Hierarchy of Training” article series, as well as our upcoming seminar series.